She rarely, if ever, feels accepted for just being herself. She must choose between sacrificing herself and losing her mother’s love–a pattern of self-denial and accommodation is replayed as codependency in adult relationships. Her real self is rejected, first by her mother, and then by herself. The consequence is internalized, toxic shame, based on the belief that her real self is unlovable. How could she be worthy of love when her own mother didn’t love and accept her? Children are supposed to love their mothers and vice versa! A daughter’s shame is compounded by anger or hatred toward her mother that she doesn’t understand. She believes it’s further evidence of her badness, and that all her mother’s criticisms must be true. Never feeling good enough her life is one of continual striving and lack of fulfillment. Since love must be earned, her adult relationships may repeat a cycle of abandonment. People with NPD are myopic. The world revolves around them. They control and manipulate their children’s needs, feelings, and choices when they can, and take it as a personal affront deserving of punishment when they can’t. Parenting is often, “My way or the highway.” Self-involvement leads some narcissistic mothers to focus only on themselves or their sons, and neglect or deprive their daughters. Other mothers want their daughter to look and be her best “according to them,” but cripple their daughters in the process through criticism and control. Such mothers attempt to live through their daughter, who they see as an extension of themselves. They want her to dress and behave just as they do, and to choose boyfriends, hobbies, and work that they would choose. “For her own good,” they might forbid or criticize whatever their daughter likes or wants, undermine her ability to think for herself, to know what she wants, to choose for herself, and to pursue it. Their attention on their daughter is accompanied by their envy and expectations of gratitude, and compliance. In adult relationships, these daughters often are in controlling relationships or get into unnecessary power struggles. 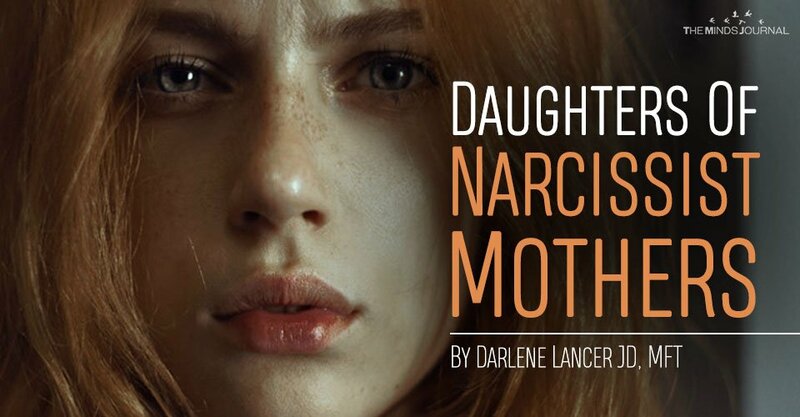 Believing she is “the fairest one of all” or fearing that she’s not, motivates narcissistic mothers to not only criticize her daughter but to compete with her daughter for her husband’s and sons’ love. Such mothers may deny or not protect their daughter if they abuse her. They may restrict or disparage her boyfriends because they’re “not good enough,” yet nevertheless compete for their attention and flirt with them. To be in control and number one in their daughter’s life, they may invade their daughter’s privacy and undermine her relationships with friends and other relatives. Recovery from the trauma of growing up with feelings of rejection and shame takes time and effort. Ultimately, it means recovery from codependency. It starts with identifying and understanding that the shaming messages and beliefs transmitted from mother to daughter are untrue. Replacing the internalized, negative, maternal voice – the internal critic – with self-nurturing is an important step. Recovery entails both healing the past and learning new skills to overcome codependency.